Making Mini Albums with Top Dog Dies! Authentique Paper and Top Dog Dies are teaming up this week to bring you tons of inspiration using Authentique Paper and Top Dog Dies products! 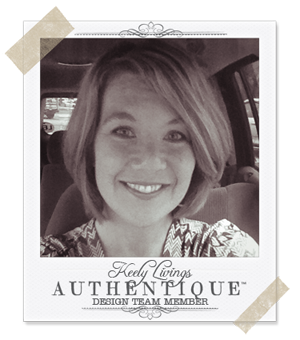 After you check out the projects here on the Authentique Paper blog, be sure to head on over to the Top Dog Dies blog to find out what the talented members of their Design Team have in store for you today! Hi friends! Keely here with my latest Authentique project featuring Top Dog Dies. I have to tell you...I'm in love with these dies! 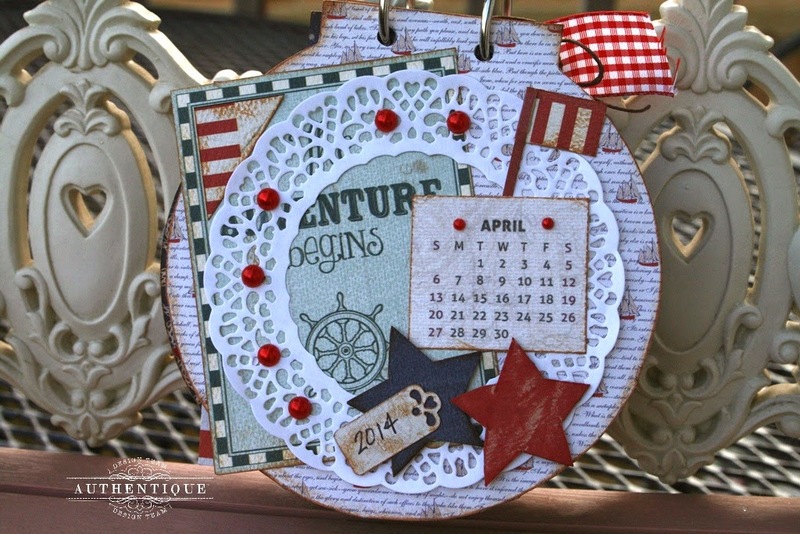 I designed my mini calendar with Top Dog Dies Cherish Doilies & Tags Die Set and Circle Mini Album Die. 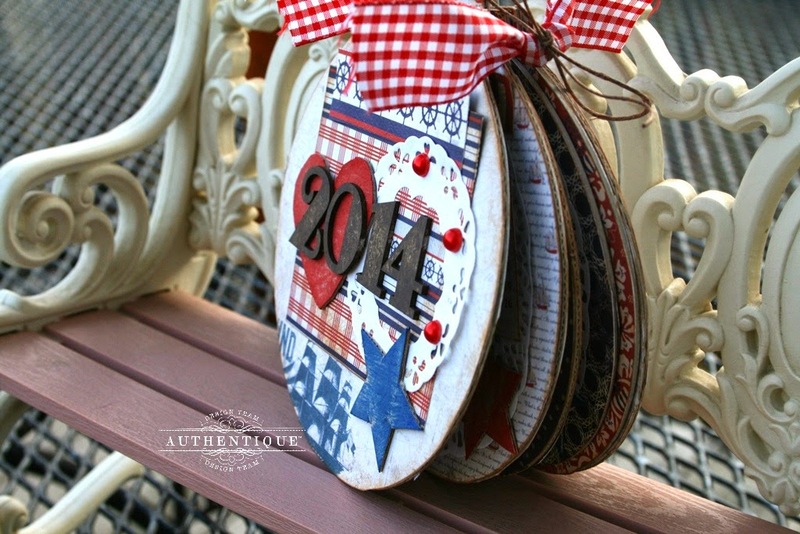 These dies are so easy to use and worked perfectly with my Sizzix Big Shot. I'll be designing lots of projects with these dies. 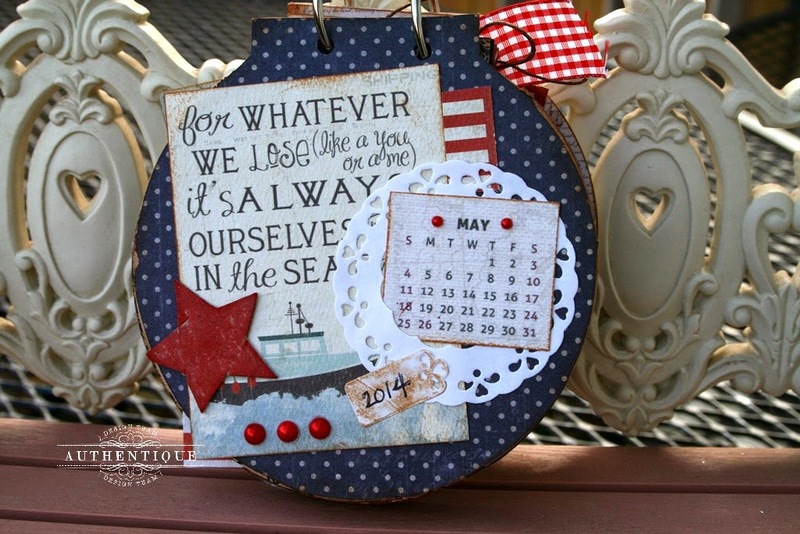 I chose the Authentique collection "Anchored" for this calendar. I love the red, white, and blue, the stars and stripes, and sailing images. What a great, versatile collection! I have a simple method for creating mini albums and projects like this calendar. Choose a few repeating items and continue those on each page. 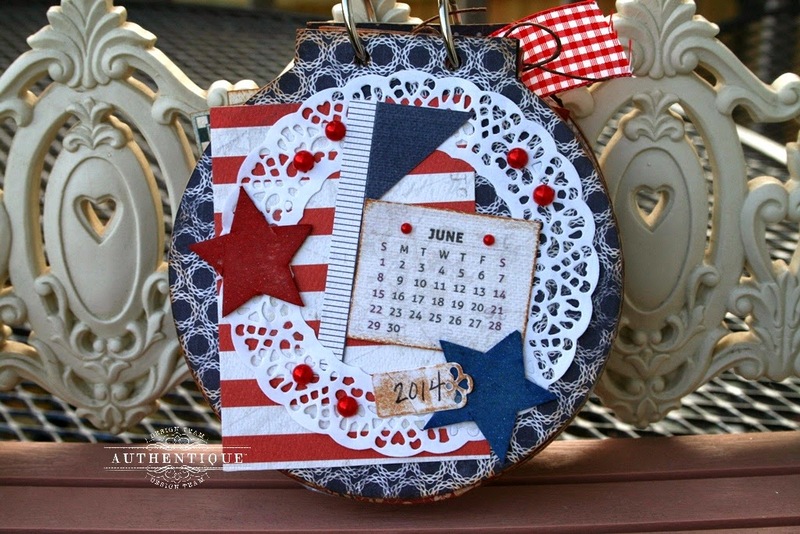 Each page includes the chipboard stars, patterned stripes, the mini calendar pages, great Top Dog doilies/tags, and red pearls. These repeating items unify your project and make creating albums fun and easy. Good Morning Authentique Fans! I had the pleasure of making this fun mini book using Top Dog Dies. I'm a little new to the manual die cutting world, and when I saw these dies, I was in love. They cut amazingly well! 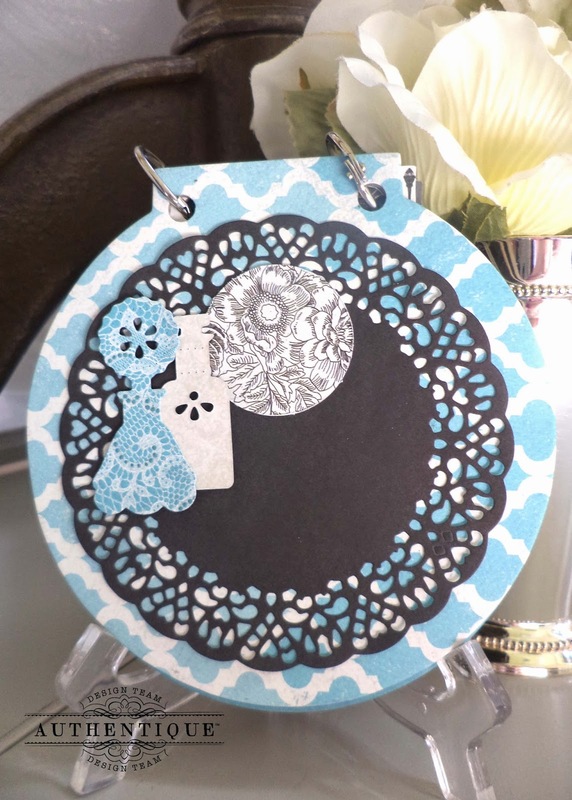 To start, I used a lightweight chipboard, and the Circle Mini Album die from Top Dog Dies. When I saw this die, I was a bit intimidated, as it is wood backed and the die is hidden in the foam. My Sizzix made simple work of it, and Top Dog Dies has a great set of instructions for each type of die and their compatible machines. I then used my Xyron 9"Creative Station to adhere the paper to the chipboard, but then got lazy and tested to see if I could adhere the paper to the chipboard and then cut it, saving a time consuming step of matching up the paper to the chipboard. Seriously, this die cut through 2 layers of textured Authentique Paper from the Classique: Elegant Collection and the chipboard in one cut. I then used my die cut machine and the Cherish Doilies and Tags Set and Bottles #1 Die Set to decorate the inner pages of each page of my mini. I really love the intricate nature of each of the doilies, and the perfume bottles are super feminine and work really well with the Classique: Elegant papers. 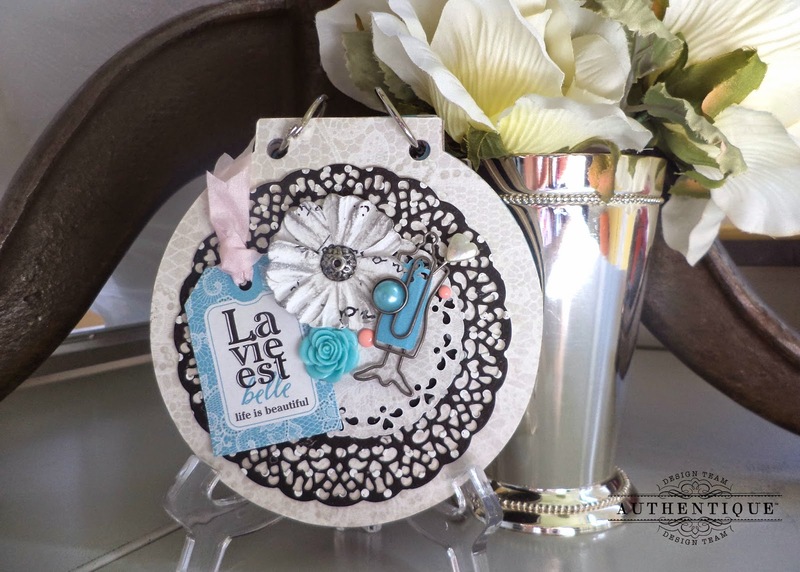 I added just a few touches from the Classique: Elegant die cuts, layering smaller doilies throughout. The 6x6 Bundle made perfect inner doilies, as the patterns are smaller and great for the mini pages. When I got to the cover, I added a die cut from the Classique: Elegant Collection, a Maya Road dress form and stick pin, a few flowers, brads and enamel dots. I chose to add just a little touch of ribbon to add some additional color and tie in the enamel dots. Also, make sure you stop by the Top Dog Dies Facebook Page and tell them Authentique Paper sent you! I love the calendar, that's a fabulous idea! 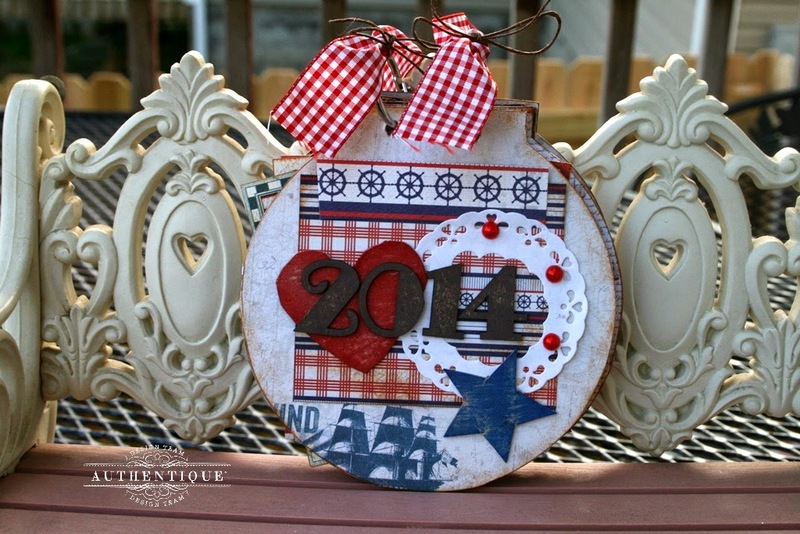 I love all of the doilies on these FABulous projects! Great albums. I need to embellish the albums that I have. I'm a little intimidated in how to cover chipboard. Got some good tips here today. thanks for sharing. A fantastic and very creative idea. It's so pretty. Just love all the lovely colors too!!! What a combination! Your paper & embellishments and those great dies make such great mini books. Nice work. Wow! I love all the detail on these mini albums. Authentique & Top Dog Dies make a great team. Wow, so elegant and beautiful! I love it to pieces! Gorgeous mini books. Truly a work of art! Love these little round mini albums and the Top Dog Dies! I just love these minis, so "elegant" I think that is my fav right now! These mini albums are stunning! Love how you used the die! It's been a fun week full of inspiration! I love the round dolly mini album. I am going to have to buy that die cut. Very cute projects and great choice of papers. Keely and Heather, you rocked it out with these gorgeous mini albums! 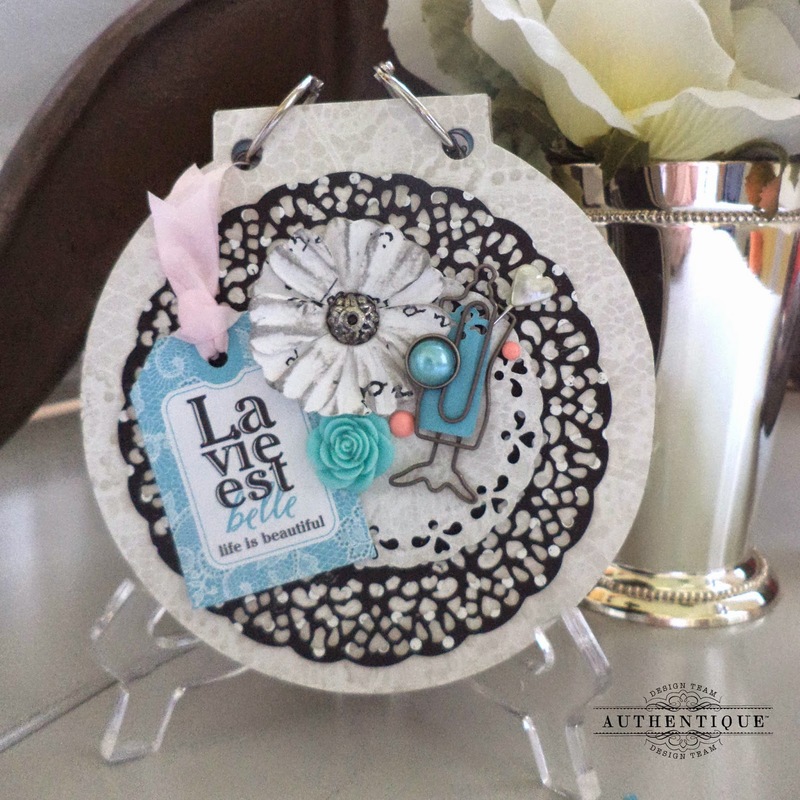 Love those Top dog doilies and circle album fabulous dies paired with beautiful Authentique's papers!! Both mini album projects are fabulous! 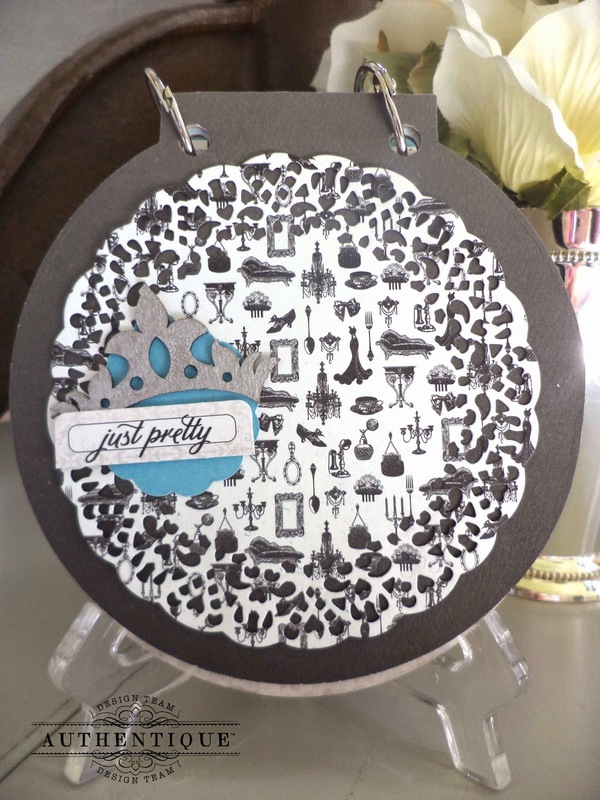 I love the repeated elements in Keely's album - what a great tip to make it quick and easy to complete. Thank you Heather for your tip about the dies being able to cut through several layers - what a time saver. Both mini albums are fantastic. I love the anchored papers lots of fun images and patterns and the elegant collection is such a gorgeous colour combination. Fabulous dies and papers on these sweet mini albums! Great job Keely and Heather! Mini albums are always so cute! I never thought about making one from scratch though! These minis are fantastic!. I might be lifting Kelly's for a fourth of july mini.